The hard drive containing the code recently failed. I hooked up the backup drive I was using at the time this was written and found it had silently broken itself while disconnected. As this was more or less a small hobby app project and I haven't had the time to maintain it, I don't foresee any rewrite occurring. Apologies to people with new laptops that aren't supported by the app. Existing files will remain hosted here for the future. I realize the post below this happily mentioned a bug fix would occur in 1.7 for memory related crashes, and I wish I could say it was written but never got pushed out, but it wasn't. I ran out of time to work on the project and sadly it just got dropped at that time. In total, I've received maybe 10-15 crash reports over the lifetime of the app and have run it on all my systems 24/7 since I wrote it without any crashes myself so I do feel the issue is fairly isolated. Once again, apologies for the abrupt farewell. There appears to be a memory related bug in 1.6-1.6.2. I've received a few crash reports that all look identical. This problem should be addressed in 1.7 which will likely be out this weekend. Sorry for the inconvenience. Power-state based GPU switching now for the 9600/9400. Please note, it is entirely possible that the 9600GT remains powered after a switch if any applications remain open. Through testing it seems to stay powered according to iStat, though it is unclear whether or not it powers down after applications are relaunched. Growl will now notify a list of applications that are keeping the 330M running on 2010 MBPs when switching to battery power. GPUInfoMenu should no longer cause screen savers to flicker periodically while on battery power with the use integrated graphics on battery option selected. By request, monochrome icons for the status bar are now available in a small preferences sub menu. Icons in the menu itself will remain in color. And under the hood, a significant reorganization of the source code to make it more manageable. ---The lag of the menu opening when the 330M is running has not yet been resolved in this release. GPUInfoMenu can now toggle between dynamic GPU switching modes and the integrated graphics on new Core i5/i7 MacBook Pros. This functionality is triggered by a menu item (off by default). There is a single toggle that switches the GPU to Intel graphics when the laptop switches to battery power and back to standard dynamic switching when on AC Power. Toggling the menu item back off or quitting the application will also return the computer to standard dynamic switching. This functionality has -not- been tested on 9400M/9600GT systems and probably will function oddly. Update: This feature was buggy and has been patched out with 1.5.2. Look for it in 1.6. The population of the list of processes is now an asynchronous task and should not block the creation of the menu; however, at this time I have yet to be able to get the menu to update while open (though I expect to nail it down soon), so you may need to close and re-open the menu. Secondary monitors will now show in the process list. Please let me know if you run into any issues. I had a few crashes occur during testing, but I believe I’ve taken care of them. GPUInfoMenu should no longer have a small hang when using Intel graphics and displaying the menu. The hang still exists with Nvidia graphics as a result of the way that I currently enumerate the process list (parsing output from the system profiler process). I’ve also removed the Console log message associated with each dependent process. 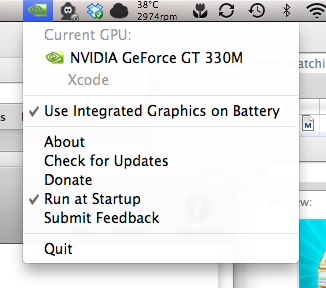 Version 1.5 (next planned release) should include GPU switching. GPUInfoMenu can now list which processes are causing the GPU switch. Apologies for the delay in updates as work has gotten in the way and this is another weekend lost for Mother’s day. With any luck, I’ll be able to add GPU forcing in the near future. Thanks to everyone who is using the app! After receiving word that someone had experienced an application crash, I’ve implemented Feedback Reporter so that crash reports can be submitted and the bugs causing the crash can be fixed. If anyone has any feature requests/suggestions, feel free to submit them. I’m looking for various ways to get some more information about triggering the GPU switching functionality, or at the least, toggling the setting that exists in EnergySaver. If anyone thinks Growl is useful, let me know and I’ll look at getting that in, though I figure it’s already in the menubar so it’s pretty clear what’s going on. So now that I consider this version free of bugs that I know of, we’re at 1.0.